OUTVETS members and supporters marched in the 2015 St. Patrick’s Day Parade in South Boston. OUTVETS, which has marched in the parade for two years, says it was not approved to march in this year’s parade. Organizers of the St. Patrick’s Day Parade in South Boston unexpectedly reinstated a ban on a group of gay veterans Tuesday, a move that sparked outrage among politicians and prompted corporate donors to rethink their support for the signature event. The entrenched resistance to including gay veterans surfaced anew when the Allied War Veterans Council of South Boston voted, 9 to 4, to exclude the group OUTVETS from the March 19 parade, even though the group had marched the previous two years. The backlash was swift and overwhelming Wednesday. The parade marshal, Army veteran Dan Magoon of Dorchester, resigned after voting in favor of the gay veterans. Mayor Martin J. Walsh, Governor Charlie Baker, Senator Edward Markey, two congressmen, and other politicians said they would boycott the parade unless the veterans council reversed course. Parade organizer Tim Duross of the Allied War Veterans Council did not return e-mails or phone calls seeking comment, but a hastily arranged meeting late Wednesday afternoon with OUTVETS at the Omni Parker House did not yield any change. Instead, the council has decided to hold an emergency session Friday to reconsider the issue, according to OUTVETS director Bryan Bishop, who attended the Parker House meeting. Meanwhile, Bishop said that the council’s core issue with OUTVETS is its inclusion of the rainbow flag — a symbol of LGBT solidarity — in the group’s logo. Some council members told him the flag violates the parade’s code of conduct because they consider it a symbol of gay sexuality, Bishop added. “I asked the question . . . ‘How does this interpret sexuality to you?’ ” Bishop said, pointing to the flag. Hours earlier, Bishop assailed the council’s decision. Walsh also denounced the council’s rejection of OUTVETS. “I will not tolerate discrimination in our city of any form. We are one Boston, which means we are a fully inclusive city,” the mayor said in a statement. Parade sponsors began withdrawing their support. Stop & Shop backed away, and officials at Anheuser-Busch and the Boston Scally Co. said they are reevaluating their positions. 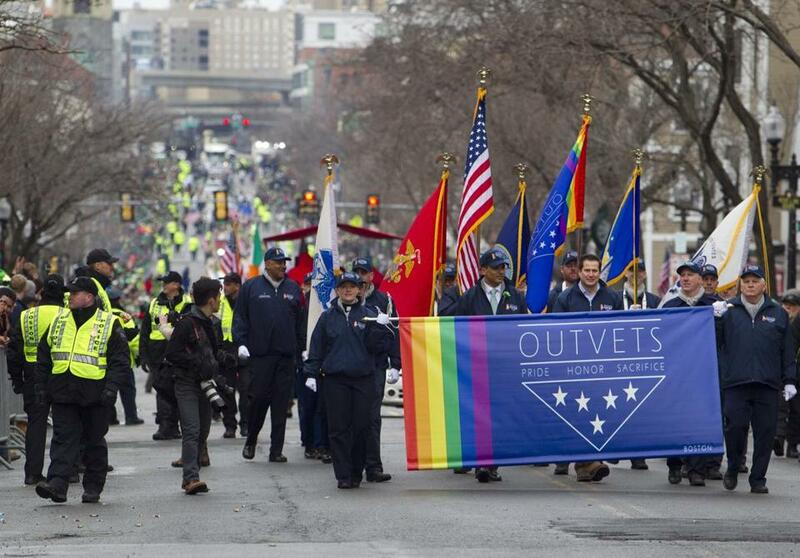 The inclusion of gay veterans in the South Boston parade has long been controversial. The battle even reached the Supreme Court, where justices ruled in 1995 that the veterans council can decide which groups march in its parade. But two years ago, the celebration appeared to have moved past that fight when organizers accepted LGBT veterans for the first time. OUTVETS marched behind a simple banner, and the parade unfolded without incident. “What I do in my role in the veterans community is to work with all veterans,” said Magoon, a Boston firefighter who served in Iraq and Afghanistan. Baker also made the case for OUTVETS marching. “It’s a veterans parade. Veterans groups should be allowed to march in the parade,” the governor told reporters at the State House. “That word ‘veteran,’ to me, approaches ‘holy,’ and the idea that we would restrict the opportunity for men and women who put on that uniform, who know full well they could put themselves in harm’s way, and deny them an opportunity to march in the parade that’s about celebrating veterans doesn’t make any sense to me,” Baker added. The decision also was assailed by Representatives Stephen Lynch of South Boston and Seth Moulton of Salem, and by state Senator Linda Dorcena Forry. “The decision to deny OUTVETS from the St. Patrick’s Day parade is wrong,” Lynch said. “Let’s just be clear, these are men and women who courageously put their lives on the line for our country,” Moulton said. Forry, whose district includes South Boston, urged the veterans council to reconsider. “For the last two years, I have had the honor of marching in an inclusive parade that has reflected the diversity of the brave men and women of our US Armed Services. I ask the South Boston Allied War Veterans Council to return to the table, reverse their vote and invite OUTVETS to participate in the parade,” Forry said in a statement. City Councilors Michael Flaherty and William Linehan, both of South Boston, said they were disappointed. “Whoever voted for this is a nitwit, and I expect this unjust decision will be reversed and the OUTVETS will be allowed to march,” Flaherty said. “I thought that over the past couple of years we had worked to compromise and that OUTVETS had done a good job and represented folks well,” Linehan said. Support for the group also was voiced on the streets of the neighborhood. Greg Kilcommons, who was walking his dog Finnegan near the intersection of Dorchester Avenue and West Broadway, said that everyone — especially veterans — should be allowed to march. “It’s for fun,” said Kilcommons, a D Street resident and Marine veteran. Meghan E. Irons, Laura Krantz, Andy Rosen, Sean Smyth, and Adam Vaccaro of the Globe staff and correspondents Jeremy C. Fox and Maddie Kilgannon contributed to this report.